Fourth Row Center: Film Writings by Jason Bailey: In Theaters: "Hugo"
Early in the film, Ben Kingsley’s Georges sits sadly at the counter of his magic shop, absently playing with a windup toy. Scorsese, always among our most visually intricate filmmakers, uses the 3D technology as his windup toy—he’s clearly having a ball working out these multi-layered compositions, throwing in unexpected foregrounds and backgrounds, imagining the possibilities of tearing his distinctive environmental tracking shots through another dimension. (He seems to get a particular thrill out of the way a Doberman’s snout looms out at us.) His joy is infectious. This is a big-budget studio 3D adventure aimed squarely at a family audience, and is thus utterly unlike anything the master filmmaker has ever done. Yet it is unmistakably his, and may very well rank among his most personal works—which is a pretty neat trick. 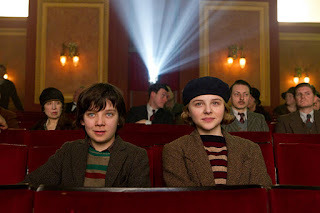 His story (adapted by Aviator screenwriter John Logan from Brian Selznick’s book The Invention of Hugo Cabret) is the Dickensian tale of little Hugo Cabret (Asa Butterfield), who was left as an orphan in the care of his alcoholic uncle (Ray Winstone), who winds the clocks at the Paris train station. The uncle has been gone for months, so Hugo winds the clocks, dodges the orphan-hunting station inspector (Sacha Baron Cohen), and tries to scrape together spare mechanical parts for the “automaton” robot that he and his father were repairing when they were together. His notes for that project are confiscated by Kingsley’s Georges, who is unaccountably melancholy and firm in his refusal to return them; Hugo enlists Georges’s god-daughter Isabelle (Chloe Grace Moretz with a twinkle in her eye) to help him. This straight-ahead story description indicates little of Scorsese’s directorial personality; it sounds like a pretty standard kiddie picture, and (in the early trailers, at least) that’s what it looked like. But Hugo pulses with its creator’s love for the cinema as none of his non-documentary films have. It starts in the style with which that storybook narrative is presented: the long opening stretch is entirely free of dialogue, from the scene-setting at the station to the slapstick pursuit of Hugo by Cohen’s inspector (the character is reminiscent of Sellers’s Inspector Clouseau, sure, but only inasmuch as that character was influenced by the Keystone Cops and other silent knockabout comics). Later, as Hugo and Isabelle become friends, he makes a horrible discovery—she’s never seen a movie. This is a true tragedy, thinks the homeless orphan kid, so he does the only sensible thing: he takes her to the cinema, where they watch Lloyd’s Safety Last. As part of that history, we’re shown a reenactment of the famous old story about the first audiences to see the motion picture of a train entering a station—which they leapt away from, afraid that the train was coming for them. Scorsese longs for that level of engagement; he uses his 3D to try and achieve the same effect. They’re all tools, the technology and the production design (Dante Ferretti, of course) and the astonishing cinematography (Robert Richardson, no surprise) and the crackerjack editing by his regular collaborator Thelma Schoonmaker. Those are the working parts; he assembles them as smoothly as any filmmaker of that time or ours. The automaton has fallen into disrepair, Hugo’s father tells him, but “the secret was always in the clock work.” Scorsese uses that “clock work” to bring the robot to life, and the film around him too. All of Hugo’s material—the movie stuff, the storybook fantasy, the slapstick chases, the heart-tugging discoveries—is presented with a sense of wonder and a wry sense of humor. But there are real stakes here. There is a sequence in which Hugo experiences the kind of disappointment that only a child can feel, and the fact that his protagonist is such a child allows Scorsese to tap into a well of pure emotion in a way that he is rarely able to. Like Wes Anderson in The Fantastic Mr. Fox or Spike Jonze in Where the Wild Things Are, he’s not slumming in his “family film”; he’s allowing the engagement with a childlike point of view to push him into new territory as a filmmaker. There is something wonderfully genuine about Kingsley’s last speech, which may be the most heartfelt and open reflection of this filmmaker’s ethos we’ve yet seen. What a magical movie this is. "Hugo" opens nationwide tomorrow. Some additional thoughts on the film's audience and influences here.